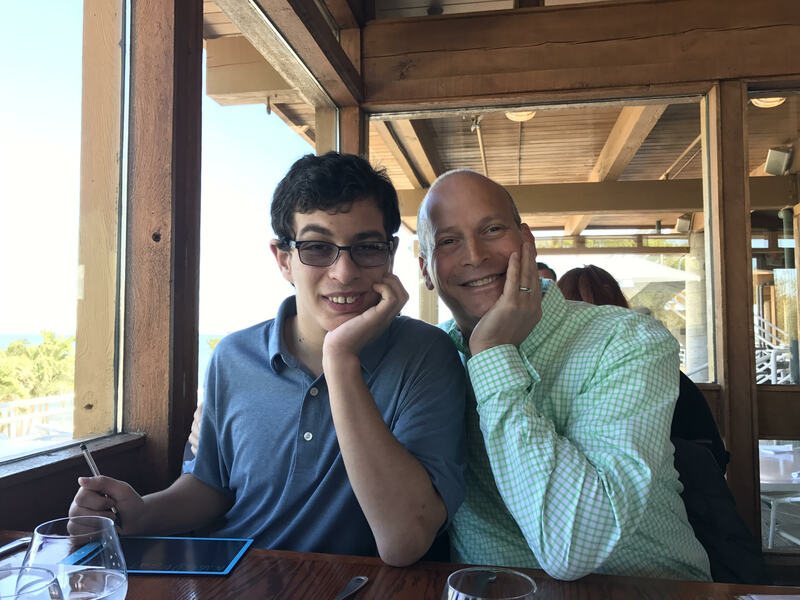 July is Fragile X Awareness Month, a time of advocacy Brian Silver's been passionate about since his son Justin was diagnosed with the genetic disorder in 2007. Fragile X is a neurodevelopmental condition that causes symptoms ranging from learning disabilities to intellectual disabilities, seizures, and anxiety. It is also the leading known genetic cause of autism. The diagnosis was tough for Brian and his family, but they immediately dug deep to find the best doctors and become powerful advocates for treatments. To help other Fragile X families access health care that's not always close to home, Brian co-founded the Fly with Me Fund with his wife. He has served on the Board of the National Fragile X Foundation, and is currently the global co-lead for Oath's Neurodiversity Employee Resource Group (ERG). Brian has a close relationship with his son. "I am his dad, and I am his best friend." We spoke to Brian about his son and his growth as an advocate for neurodiversity at Oath. Can you tell us a little bit about Justin and how he's "raised" you? Justin's an amazing young man. He's 17 years old now. He loves to connect. He loves hugs. He likes puzzles. He loves to talk. He's made me a much better person in every way. I choose to be proactive in the Fragile X community. I choose to be proactive at Oath within the Neurodiversity ERG. Justin has been the catalyst for that. He's been a catalyst for everyone who's touched his life. Has it been challenging to balance work and his needs? One of the things that I say all the time, and I think is really important as we continue to do the work here at Oath, is I got lucky. I got lucky because there were people in my life and in my work that would allow me, as a caregiver, to do what I needed to do in order to take care of my family without harsh penalty. I always look back and say I probably should have lost every job I ever had, especially during the early years because they were so difficult. How did you become Global Co-Lead of Oath's Neurodiversity ERG? The ERG was established at Yahoo before the Oath integration. As the Diversity & Inclusion program began to take shape at Oath, I was approached and asked if I would join and help it grow. I started talking to the group founder and it became very obvious that if we could establish as co-leaders, one of us could represent people affected [with neurological differences], and the other could represent the caregivers of those affected. When you are affected and you are at work, you can ask for things to help accommodate you. When you're a caregiver, those things are out of your control. If I get a phone call right now that Justin's having a debilitating seizure, and I have to run to where he is, then I hope that people around me understand. So far in my life they have, but what Oath is putting together is not just hope so much as a strategy. What it's putting together is an inclusion environment where it's safe to have those conversations with your manager about the fact that you may have to leave if there's an important moment. How has it felt to bring your personal experience to shaping Oath culture? It's really been incredible. My role is global, so everywhere I travel I try to make sure that ahead of time we set up a little bit of time for me to be able to go in front of the population and talk about neurodiversity. If you think about it this way, we have about 14,000 people at Oath. I would not be exaggerating if more than half of our population is affected and/or a caregiver of those affected. I'm not shy in talking about my situation, which I think is helpful to me, but it also seems to be an opening for others to be able to come in. We're getting a lot of feedback. We're getting a lot of "Thank you so much for doing this," "Thank you so much for being here." What other goals do you have for supporting neurodiversity at Oath? Within the Fragile X community, our children are growing up. This is not unique to Fragile X. It's happening in all disabled communities. These young adults have the ability to work, and we need to evolve our services. What I'm really proud about is that we [Oath's Neurodiversity ERG] have started to get very deep into the HR world, and have started to train HR in looking for signs of people who would be excellent candidates to work here, but yet wouldn't necessarily make it through our interview process. I'll give you a really good example: If I had autism and we were doing a job interview, I may never look up from this table. I may never change my voice pattern. I'd be monotone. That's the way I present myself to the world, but the resumé that you have in front of you is exceptional. So we created videos for HR to watch and begin to understand how to look beyond the obvious. How do you generally close your talks on Fragile X at Oath and beyond? Everyone should get tested. It's a simple blood test. If there's autism in your family; if you have aunts, uncles, cousins, nieces, nephews that you feel are on the autism spectrum, get tested for Fragile X. It's better knowing if you're a carrier and having choices about having children than being surprised.